Which suits? the styles explained — everAFTER magazine everAFTER magazine celebrates and inspires a couple’s journey from their engagement through to their wedding day and beyond including lifestyle and travel. Wedding venues, bridal, fashion and styling inspiration. Do you wonder what is the difference between a suit bought from a store ‘off-the-rack’ vs one ‘made to measure’ or ‘bespoke’. Our response is simple, “making a great suit is like making a great car”, just depends on what you like to drive. HERE'S A LITTLE EXPLANATION ON THE DIFFERENCES AND PROCESS IF YOU ARE TEST DRIVING SUITS. Often the first suit most people will own will be one bought from a store “off the rack”. These suits are sold in generic sizes, e.g. 38/48 or 40/50 and are made by machines. Off the rack does not necessarily mean they are cheap, prices vary significantly starting in the hundred to the thousands, depending on the fabric and designer. 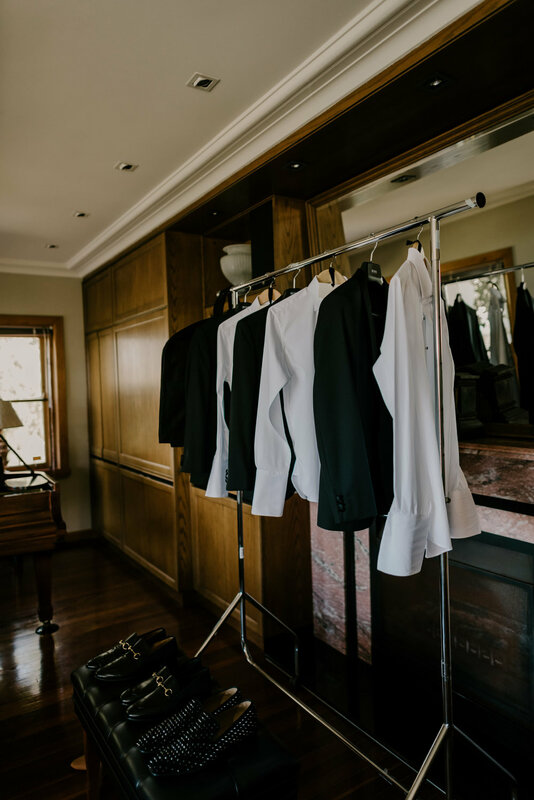 Off the rack suits rarely fit as they are, often requiring alterations in the pant length, waist and arm length, which can be a costly process depending no the amount of alteration required to achieve the perfect fit. A majority of suits bought off the rack are fused not canvassed, this means the interlining is glued to the suits shell rather than sewn in place. Over time and with excessive dry-cleaning the fusing can shift and a rippling can occur if direct heat during steaming is applied causing the glue to melt. We often see this in shirt collars and cuffs from ironing at a high temperature. You are also limited on styles and colours depending on what is in 'fashion' that season. Made-to-measure is essentially pre-made patterns, like those a designer would use when making a suit for a store “off the rack”. The significant difference is that these patterns are altered based on your style preferences and unique measurements taken by a master tailor to create a perfectly fitted suit just for you. Most made to measure suits are made using a mix of machine and hand stitching. The benefits of having a suit made for you extend much further than simply the fit and quality. You’re essentially becoming your own designer guided by the architect (your tailor) across four to six weeks. Once you’ve been measured the creative process begins, you’ll be shown a range of high quality cloths from leading mills around the world likely to range from pure wool to wool blends and fine cashmeres. While a suit can say business on the outside let the inside show your fun side by choosing a bright bold lining. Single breasted or double, peak lapel or notch, and how many pockets would you like? These are just some of the decisions you get to make when designing your made to measure suit, which is only limited by your imagination. Designed and made by hand a bespoke suit is the creme-de-le-creme of suit making, unlike off the rack or made to measure the pattern for a bespoke suit is made especially for you. You can expect to have up to four fittings as your suit is constructed, working with your master tailor through every manual stitch and design feature. The canvas in a bespoke suit is likely to be a blend of wool and animal hair, you’ll choose from horn or fine wooden buttons, and only the highest quality cloths are used. The art of making a bespoke suit is a specialised one, passed on through a generation of master tailors to a select few who continue to dress those who demand the best. Having a bespoke suit can set you back the same price as a small car however the out come is that of a Rolls Royce.